If you cannot open the trunk, use the following procedure. 1. 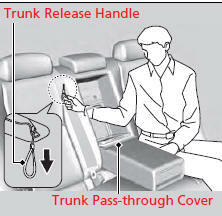 Open the trunk pass-through cover. 2. Pull the trunk release handle down. After taking these steps, contact a dealer to have the vehicle checked.